First up isYellow 6 with a white winter wash. This JG 51 plane is from 1944 and has a yellow spinner, rudder and tail band. Red 11 is from 2./JG 302 with a white spinner spiral, broad yellow fuselage band and yellow lower wing tips. 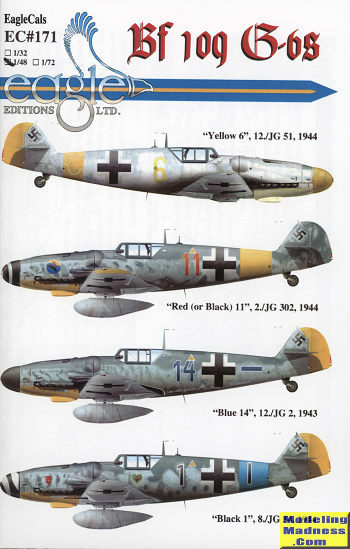 Blue 14 with 12./JG 2 has a yellow rudder and was in operation during 1943. Finally, we have Black 1. This option has a blue fuselage band as with I./JG 54 in 1944 and has a yellow rudder. The spinner spiral is very broad. 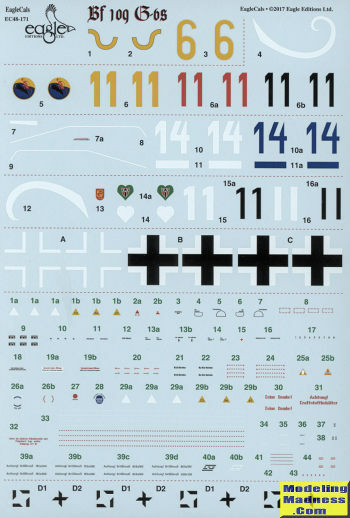 The sheet is superbly printed and has insignia and data markings for one plane. Instructions provide a wealth of information on each option and includes an extensive data placement guide. Thanks to EagleCals for the review set. You can buy yours at this link.